And this be our motto:"In God is our trust." On the shore, dimly seen through the mists of the deep, Where the foe's haughty host in dread silence reposes, What is that which the breeze, o'er the towering steep, As it fitfully blows, now conceals, now discloses? Now it catches the gleam of the morning's first beam, In full glory reflected now shines on the stream: 'Tis the star-spangled banner! O long may it wave O'er the land of the free and the home of the brave. And where is that band who so vauntingly swore That the havoc of war and the battle's confusion A home and a country should leave us no more? Their blood has wiped out their foul footstep's pollution. No refuge could save the hireling and slave From the terror of flight, or the gloom of the grave: And the star-spangled banner in triumph doth wave O'er the land of the free and the home of the brave. Oh! thus be it ever, when freemen shall stand Between their loved homes and the war's desolation! Blest with victory and peace, may the heaven-rescued land Praise the Power that hath made and preserved us a nation. Then conquer we must, when our cause it is just, And this be our motto: "In God is our trust." And the star-spangled banner in triumph shall wave O'er the land of the free and the home of the brave! 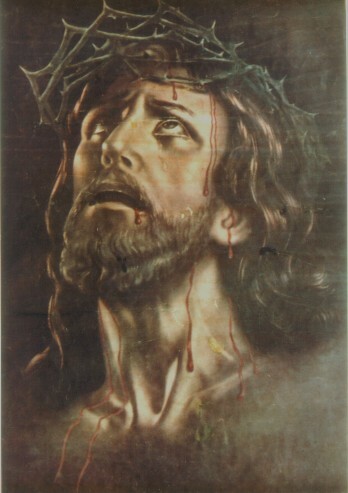 The blood of the martyrs is the seed of the Church." These words by Church-father Tertullian, who lived a hundred years after Christ, still maintain their validity in today's world. In our work for the Persecuted Church, we come into contact every day with Christians who have to face the threat of death for their faith. Our motto, "Strengthen that which remains, and is at the point of death" is precisely the reason why we find ourselves in those areas where people are being persecuted most severely. And it is also there that we find the church is growing! Corrie ten Boom's plight in Nazi Germany during World War II. Brave Christians who refused togive up their faith. A faith that allows them the glory of dying for theirLord. thatwe to may have the same strength through faith in Jesus Christ. This Page is dedicated to martyrs. and still refusing to apostasize. Please read and listen to the story of the martyrs. Find out what you can do to help persecuted Christians today. Finally, remember your fellow Christians that are suffering. As Joan of Ark was dying at the stake, she said this quote. and yet they give their lives to that little or nothing. When life is all we have we live it till its gone. is more terrible than dying. Even more terrible than dying young. What do you burn for? What do you burn for? years before he his martyrdom. That man is no fool. and to gain what he cannot lose. God light these idol sticks of my life, and may I burn up for thee. Consume my life my God, for it is thine. I seek not a long life but a full one, like yours Jesus. were all martyred by the Auka Indians in 1956 in Ecuador. Nate was the pilot, found out all the details of what had happened. the killing of his father and others. where he could have easily gotten away. "Why are you killing us, we're not killing you? And waited there till they came and speared him too. And no sooner had they killed the last one. waiting for retaliation, nobody came to come. That’s why they were so into the Gospel when they came back. Listen to what Nate Saint wrote years earlier. ask why in the world do we waste our lives as missionaries? to show for the years they have wasted. everyone us at the end of our lives-its gone! What do we spend our lives for? What do we pour ourselves out for? What do we give ourselves to? Having a full life is not necessary a long life. I want at the end of my life to say I have fulfilled the purposes of God. This is where you are seated for the marriage supper. all on fire for God. He said, Rebecca, where are you from? Then he said, “Rebecca, would you talk to me for a few minutes of how you got here? with my own eyes I watched lions eat my daddy. and I never cried so much in my life as I did that day. and I had never been scared in my life. HE WAS MY REASON FOR LIVING. and I have been waiting here for the marriage supper. And how about, you whats your story? You better be able to say something! that 160 thousand people were martyred in 1996 for the cause of Christ? Because cartel members, drug addicts were being saved, dealers were being saved. No, Just leave me here I can just walk. but to live for HIM, can be harder that dying for Him. in days to come in America. Because gospel message is going to become increasingly biblical. and the gospel messages going to become a threat to this world system. and the gods of sports and entertainment and fashion. uproar, persecution, and great moving of God. and is going to come down on you guys. I am telling you young kids that the great awakening is coming in your lives. we stand on the shoulders of forefathers and foremothers who paid the price. but what happened to the rest of them? felt unworthy to die on the same type cross as his Lord! he died a martyr’s death- fileted alive with knives. James the Elder was martyred first he was slained by Harod Agrippa. James the Lessor was crucified in Egypt and his body was sawed in pieces. from which he drank and God spared him and died of natural causes. Jude was killed, shot with arrows at Mount Ararat. history records that he became a missionary and disappeared during his labors. and he felt he was not worthy to die as his Lord died. for even his body to be treated as the body of the Lord, Jesus. Simon the Zealot tradition said he died on the mission field as a martyr. there he was killed with a spear, as a martyr. Now, but this is my desire. a life that makes sense in the light of eternity. JESUS- *MY LIFE FOR YOU*.